Today was her birthday. 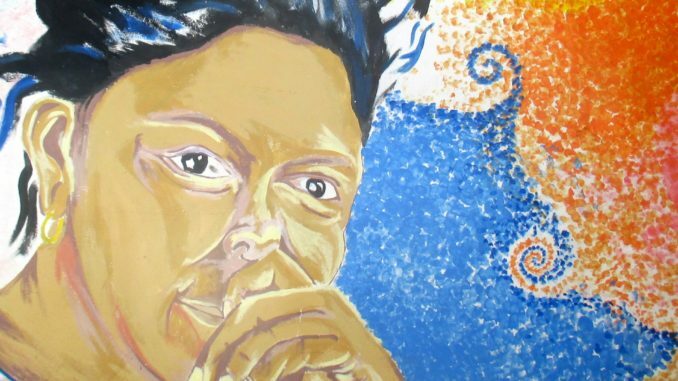 Berta Cáceres would have turned 46 years old today, but instead of gathering to celebrate her birthday, people have been gathering to mark the anniversary of her death. A lifelong organizer and activist, Cáceres was the co-founder and general coordinator of the Civic Council of Popular and Indigenous Organizations of Honduras (COPINH). She was shot to death in her home the night of March 2, 2016. Eight suspects, including members of the Honduran armed forces and employees of a hydroelectric dam company, have since been arrested in connection with her murder. In Honduras, COPINH and other organizations coordinated a week of events to mark the anniversary. Indigenous community members from around the country came together for a workshop on free, prior and informed consultation and consent in Tegucigalpa, and led a march in the streets of the capital. In La Esperanza, events were held at Utopia, COPINH’s community gathering place on the outskirts of town. At Utopia, amid vivid murals and sweet-scented pine trees, the discourse didn’t focus on the murder that has garnered so much global attention. The focus was on the broader issues and struggles for which Cáceres lived and died: autonomy, territory, justice, equality, collective rights, self-determination, and so much more. To continue the struggle is to honor her legacy, COPINH general coordinator Tomás Gómez told the crowd gathered March 2 for an evening of cultural and artistic celebration. “It’s very clear to us that when we talk about Berta, we’re talking about COPINH,” he said, articulating a sentiment heard often over the next 24 hours. Tomás Gómez became the interim general coordinator of COPINH following Berta Cáceres’ murder. All photos by Sandra Cuffe. As the murders of Cáceres and community leaders in the area have shown, carrying on the struggle carries great risk. The sobering reality in which resistance struggles and social movements exist in Honduras was also a topic of discussion at Utopia. A thin crescent moon rose above the outdoor stage while Gómez concluded his remarks in the fading twilight. Honduran singer-songwriter and activist Karla Lara was up next, with a Mercedes Sosa cover. A faint echo of the last few syllables of each sung line bouncing back off the hills behind Utopia was audible during the quieter moments of the song, and each time the chorus repeated the word sobreviviendo (surviving), the surrounding lands responded with the word viviendo (living). Later that night, candles were lit and placed in and around an altar peppered with photographs, flowers, corn husk dolls, and other contributions. 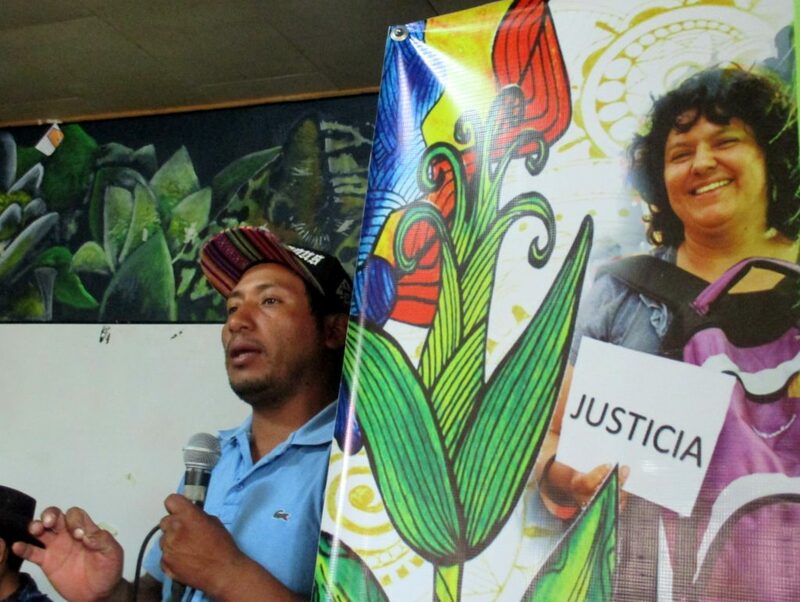 Between March 2 and March 3, vigils and other actions were held throughout the Americas and beyond, commemorating Cáceres’ life and demanding justice for her death. 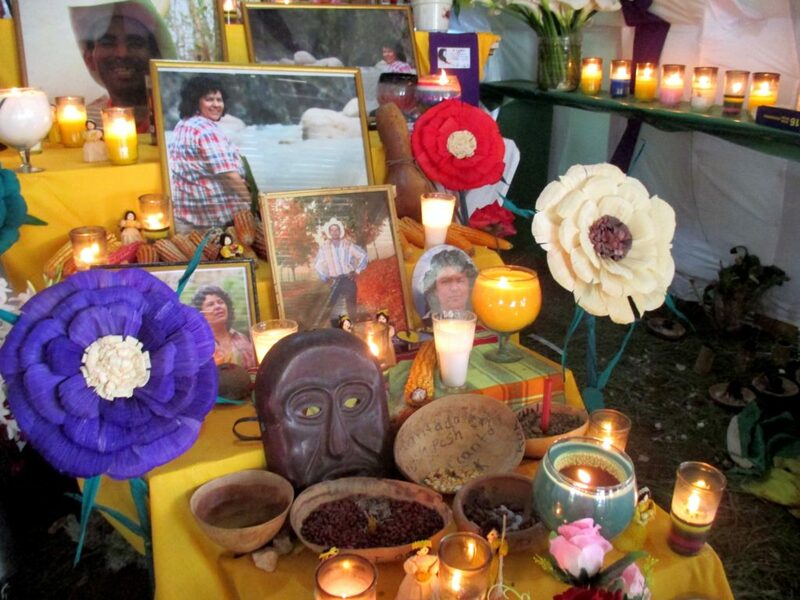 An altar was set up outside Utopia for the one-year anniversary of Berta Cáceres’ murder. “We’re going to need to sustain the pressure in some way,” Cáceres’ daughter Berta Zúñiga Cáceres said at a March 3 forum at Utopia. The arrest of high-ranking military personnel is a testament to international solidarity and pressure, she said, but the intellectual authors of the murder have yet to be arrested. “To say ‘Justice for Berta’ is to make a commitment to work that will take a lot of effort and will demand action and solidarity,” she said. Zúñiga Cáceres and her three siblings grew up alongside COPINH, which was founded 24 years ago this month. Cáceres’ children became somewhat accustomed to hearing about threats against COPINH while they were growing up, said Zúñiga Cáceres. However, things took a turn for the worse after then Honduran president Manuel Zelaya was ousted in a June 2009 coup d’état. At a March 3 forum in La Esperanza, Berta Cáceres’ daughter Bertita Zúñiga Cáceres spoke of growing up alongside COPINH. Following the coup, successive government administrations have heavily militarized the country, privatized public utilities, and issued licenses and concessions for countless natural resource projects, many of which have since been linked to human rights violations against activists and community opponents. The Agua Zarca dam project on the Gualcarque River is one such project, and it continues to face fierce community resistance from Río Blanco and from COPINH. It has received significant international media attention, particularly in light of suspected ties to Cáceres’ murder. It’s a very important and emblematic case, but it’s far from the only one, said Zúñiga Cáceres. “It’s not just Agua Zarca. Concessions for 49 projects have been granted just in Lenca areas, and we can’t forget that,” she said. 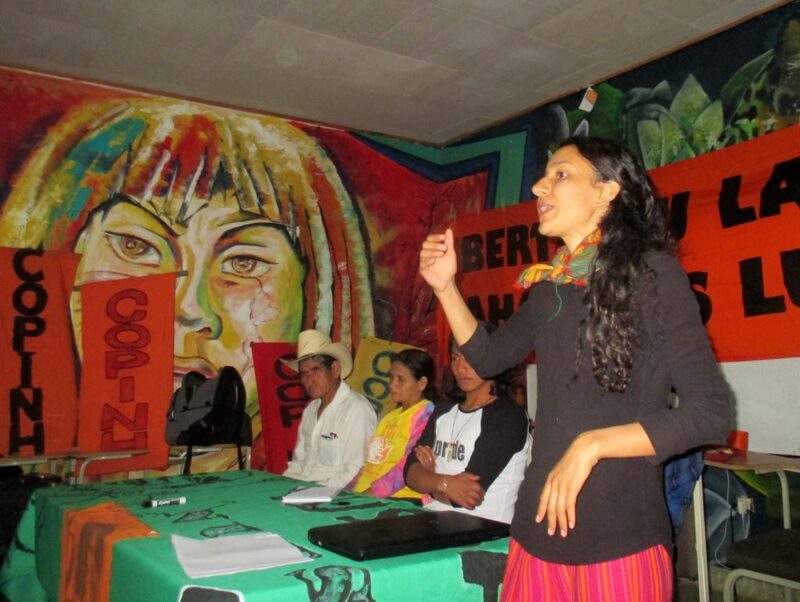 COPINH leaders who addressed the March 3 forum at Utopia also didn’t want people to forget that Cáceres’ involvement was not limited to Agua Zarca or even to the defense of lands and resources, and took issue with her characterization in the media. “She wasn’t just an environmentalist,” said Gaspar Sánchez, the COPINH coordinator of sexual diversity, while he reeled off some highlights from COPINH’s history and that of Cáceres. 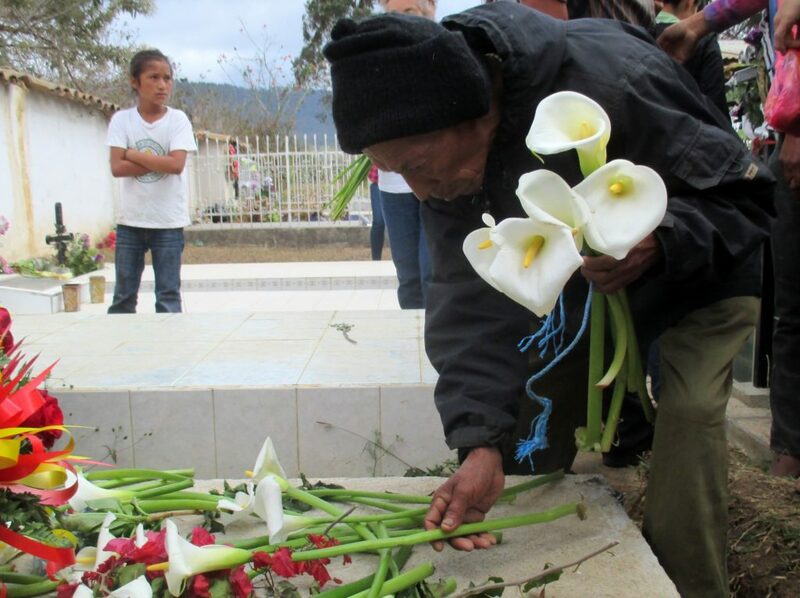 COPINH members and supporters gathered at Berta Cáceres’ grave on March 3, 2017. “Berta fought the battle of struggling against the patriarchy, machismo, which is very entrenched in communities,” said Sánchez, adding a mention of her commitment to anti-militarization struggles. The challenge now is to continue those struggles, he said. Sandra Cuffe is a freelance journalist based in Central America, where she covers environmental, indigenous, and human rights issues. You can find her on twitter at @Sandra_Cuffe.